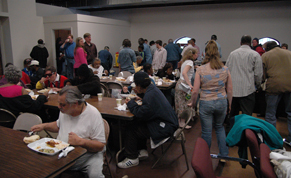 On Sundays, we open our doors at 3:00pm so the poor and the homeless can come in and have coffee before the service. At 5:15pm, our worship team leads us in contemporary-style worship. We place a high value on worship of our Lord and Savior. Our service ends around 6:30pm and is immediately followed by a free dinner. Everyone is welcome to come and have dinner. Each Sunday, one of over 70 churches and groups prepares and serves dinner for our congregation. We clean up after the meal and finish around 8:00pm. People can come just as they are and worship in the house of the Lord. 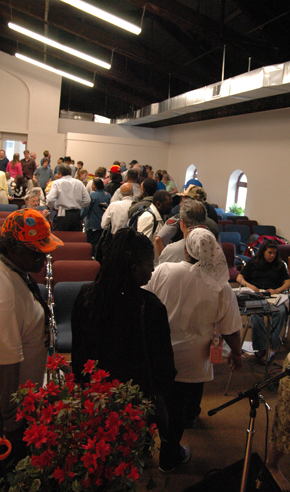 House of His Presence was established in June 2007 as sanctified time of prayer, worship, and seeking the Lord on behalf of the City of Pittsburgh. We meet every Friday, beginning at 7:00pm, in the sanctuary on the third floor.